This week I’m feeling so much better after being taken down by a dreadful flu last week! I’m so excited to be back in the saddle and sharing with you all my vintage passions! As time evolves from the VCR to DVD, DVD to online I’m sure many of us now use Netflix or another service. I thought for today I would put together a list of TV shows and mini series that have a vintage nature to them that you can watch! I had originally planned to include movies, other periods, and other notable films available but I thought this list of TV programs would be the first part to this series featuring vintage on Netflix! As I’m in Australia I do believe we have less available compared to America, so I’ve made a list of what is available for us here, but I’d love to hear what other countries or websites have available! I have also only seen some of what I’ve listed below, but look forward to watching each of these! Land Girls is a TV show following the lives of members of the Women’s Land Army during World War II working at Hoxley Estate. While this is a fictional TV it gives a glimpse into the evolving roles of women as time begins to change. I’ve almost finished viewing this series and I adore it so much, I think many of us vintage lover glamorise our favourite eras and this gives a taste to what people would have experienced, having to pack up their lives to work, sending husbands to war with some never returning, the fear and impact the war had. Call The Midwife’s stories starts by following a young woman named Jenny Lee who works as a midwife with other midwifes and nuns from Nonnatus House, a nursing convent in Poplar which is a district in London consisting of very poor people which proves to be a big adjustment for Jenny. We follow the midwives on their journeys during the 1950’s and 1960’s. This show is quite a rollercoaster of emotions, but it is also very heartwarming. I really adore that this is based upon the memoirs of Jenny Worth as while it has been adapted, we are looking through this time through her eyes, and her experiences. A two episode TV mini-series based upon William Boyd’s espionage novel, Restless. A young woman discovers her mother was involved in the British Secret Service during 1940’s and has been on the run since her last mission. This mini series looks closely at the life of one of the greatest popular artists of the 20th century, Frank Sinatra. From Sinatra’s retirement concert in the 1971 in LA he chose 11 song to best share his life and evolution, the documentary uses these songs to explore his life, music, and career. This documentary series takes footage from World War II using colourisation technology to shine a new light upon what took place during this war. Some items brought up in this series have come into question for historical accuracy though, while I haven’t seen this myself I’m sure it would be interest none the less. A documentary mini-series by Ken Burns following the events the eighteenth amendment to the U.S constitution putting the alcohol prohibition in place from 1920 until 1933. It looks to how this came about, how it effected culture, the black market alcohol trade, criminals and the fall of the amendment itself. The Bletchley Circle is a series based around four women who during World War II worked together as code breakers at Bletchley Park, they’re reunited in 1952 to track down a serial killer using their unique skills. Man Men is a highly acclaimed tv series with seven seasons starting at one of New York’s most prestigious ad agencies with the spotlight on the mysteriously handsome, and talented executive, Don Draper! What I really love about this show is it truly takes you to another time and as the show progresses you travel through time and see the era evolved in fashion, beliefs, and style. I’d love to hear if you’ve seen any of these shows, please comment and let me know what you though of them! If I’ve missed any please let me know too, so I can update this post! More vintage blogs coming real soon! You need to watch Bomb Girls ,I love it and it’s on Netflix also . I’ll have to find an alternative way to watch it, sadly Australian Netflix has different programs available. 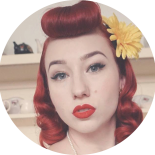 This entry was posted on March 8, 2016 by Miss Lady Lace in Pinup and tagged 1940's, 1950's, 2016, australia, blog, blogger, glamour, Lady Lace, miss lady lace, miss lady laces pinup blog, nicole, perth, perth burlesque, perth pinup, perth pinup blog, pin up, pinup, pinup blog, pinup blogger, pinup fashion, pinup girl, pinup life, pinup lifestyle, pinup on netflix, pinup on netlfix, red lips, retro blog, retro girl, retro glamour, retro netflix, victory rolls, vintage, vintage blog, vintage blogger, vintage fashion, vintage girl, vintage glamour, vintage netflix, vintage on netflix, vintage perth, vintage pinup blog. I might be having glamorous adventures in Hollywood but I'll be still be sharing glamorous weekly videos to my blog that I worked a hard to put together before leaving for our trip. Today I have for you a fabulous blog reviewing the nail press on kits from @kustomklaws.au They're kits give you temporary nails that last up to 48 hours, but are they as amazing as you'd hope? View the full video from the link in the comments below!